Award Ceremony!!! I'm so proud!!! I am so very proud of my little guy!! He has met so many hurdles over these last five years of his life. Even from the day he was born he stopped breathing four times. They told me they didn't think he'd make it through the night ~ to their surprise he made it! I knew he would he's GOD's child!!!! I love him so much! As I said I'm very proud of him. Today at school he received an award for Physical Education Student of the Month Award; for displaying exceptional athletic ability and outstanding character. I am very proud of him as with two out of the three delays that effect him physically the hypotonia and the dyspraxia. He followed every direction given, he gave his all, he put his heart into what was asked of him as hard as he struggles. I'm so proud that he has done this! 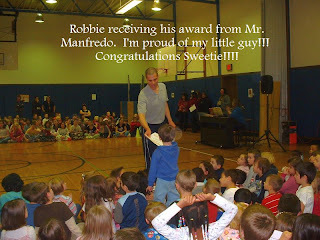 I love him to pieces and here is a snapshot of him getting his award. Congratulations, sweetie Mama and Daddy are very proud of you!!! !